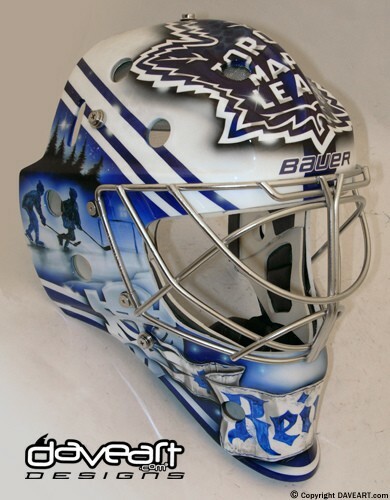 Looking for Reimer’s 2011-2012 Mask? – we have game shots of it as well. 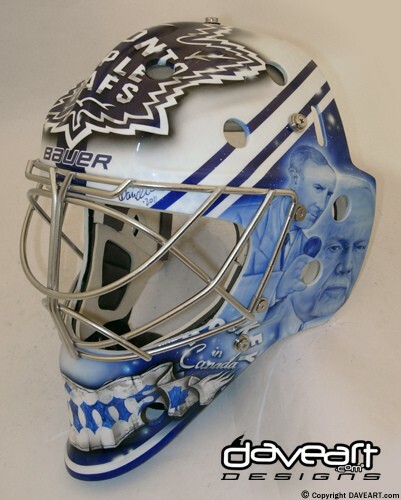 From Don Cherry and Ron MacLean on one side, to Optimus Reim on the other, and Jesus on the back, James Reimer has a bit of everything on his goal mask. 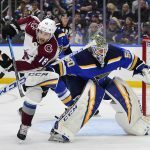 James Reimer has made no shortage of headlines with his stellar play this season – and for the inspiring story of his rise from fourth-round pick and ECHL afterthought to playoff run hero for the Toronto Maple Leafs. 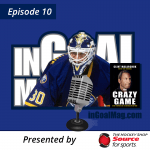 Reimer himself once called his journey from small town Manitoba to the Maple Leafs a miracle. 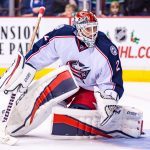 The 23-year-old has certainly inspired faith from the fans – and he recognizes both his faith and his fans on his masks. 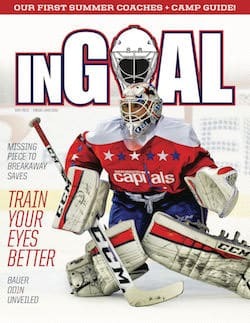 Toronto’s fans get their tribute in his newest mask (pictures at bottom), which is much like the old one with the exception of adding on a small modified Transformers symbol to the right cheek. 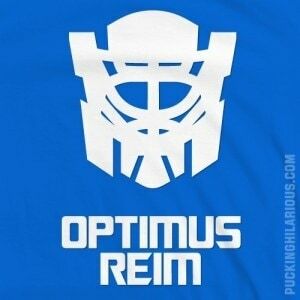 It’s a play on the Optimus Reim nickname given to him by a fan who began selling t-shirts with it (and the symbol) on his Pucking Hilarious website. 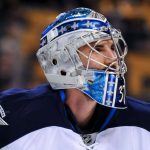 Reimer has embraced his fan, and told Globe and Mail reporter James Mirtle he is even considering a completely Transformer-themed mask for next season. 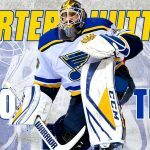 As for the faith, that’s something the religious Reimer has always embraced. 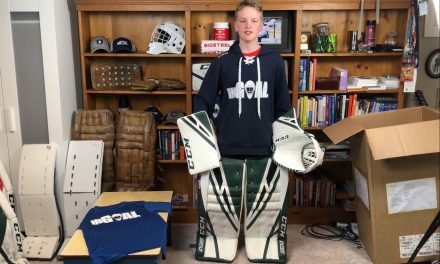 From growing up in a small Mennonite community like Morweena, to tending goal for the Maple Leafs, Reimer wears it proudly (he recently talked about it in a separate Globe and Mail article by Mirtle). 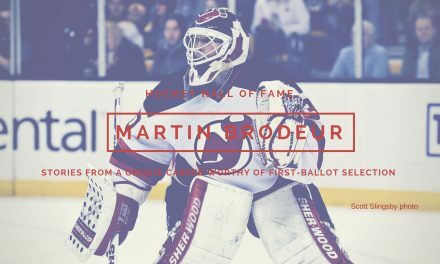 It’s right there on the back of his current mask, which also features a pond hockey game from his youth on one side, and Hockey Night in Canada icons Don Cherry and Ron MacLean on the other. The guy on the backplate is a little more famous, though. 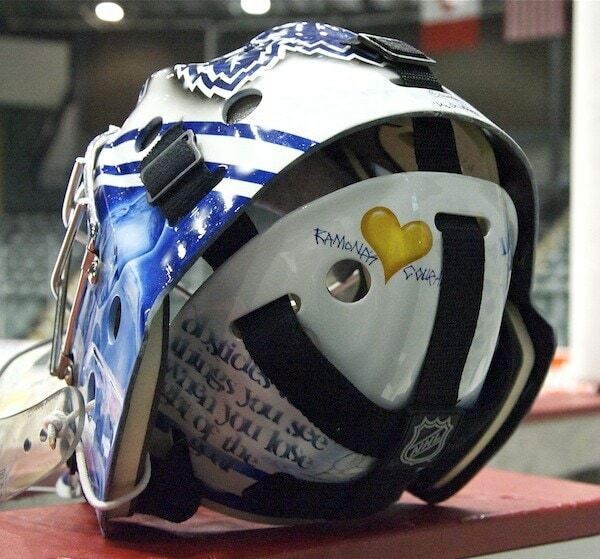 In addition to the mental tip on the lower left, Reimer's mask has a yellow heart with the words “Ramona’s courage” in honor of his cousin’s wife who died of cancer more than a year ago. 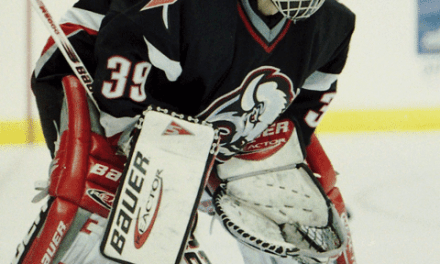 It’s one of 10 mental tips Reimer’s former major junior goalie coach, Andy Nowicki, drove into him in Red Deer. 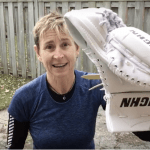 “Andy gave me a little sheet with 10 things for success and I’ve taken two of those and one is a simple saying: Don’t give yourself the luxury of a day off,” said Reimer, adding the other is on the back of the mask. 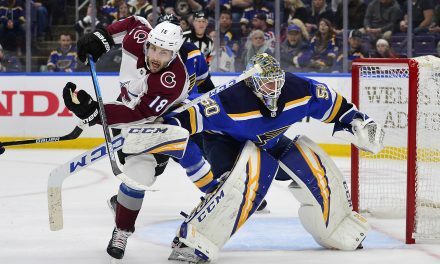 “So in this work if a guy is screening you, or there’s a guy in your crease or a penalty, if you are worrying about that you are losing sight of stopping the puck and winning the game. So it’s a nice saying to have to battle through adversity. 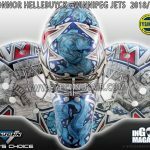 ~ Here are some up-close looks at the updated mask completed by artist Dave Gunnarsson of Daveart.com. 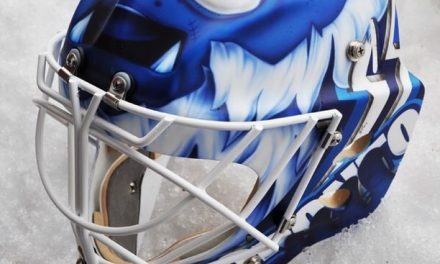 It is essentially the same design he was already using with the addition of the “Optimus Reim” logo representing the nickname that his growing legion of fans have given him. 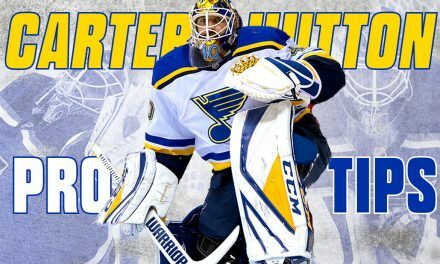 I am very proud to be James Reimer’s painter. 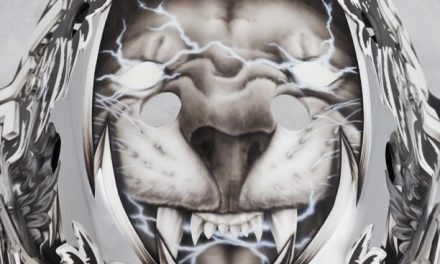 This design is a continuation on his previous and enormously popular mask with lots of details that I got the honor to create. The design is a celebration of his childhood. 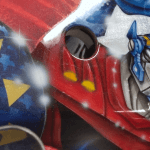 The paintings on the sides are very similar to the ones on the first mask, just some minor changes. On one side you see children playing hockey on a pond, and in the background you see a house with light in the windows, mother and father are waiting for the children to come in from the cold. I love to create paintings with much details that tell a story. This side I created like a motif in a children’s book. The other side is a tribute to James’ favorite TV show Hockey Night. I painted Cherry and MacLean in blue tints in a layout on the side with glistening stars around. Around all this I put together a Maple Leafs design with the beautiful maple leaf and graphic lines that tie the whole together, creating a truly unique design. 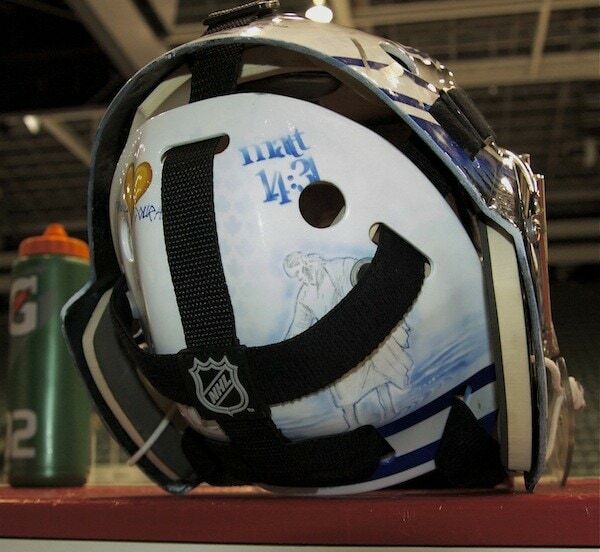 And if you look close, we have also incorporated a small celebration of Reimer’s fantastic fans on one side of the mask. 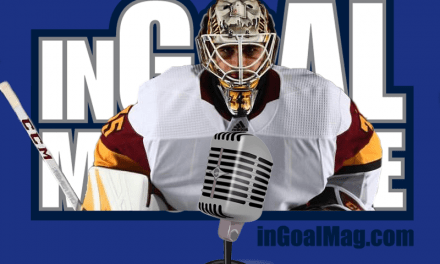 PreviousPlayoff Preview: What if a No.1 goalie blows a tire? 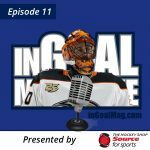 David is one of the founders of InGoal Magazine which he began in 2009.Of course he finds time for some goaltending of his own as well, and despite his age, clings desperately to the idea that some NHL team will call him to play for them - though in his mid-forties (OK, late 40s) it'll likely be for a practice when everyone else on their depth chart has the flu and the shooter tutor has gone in for repairs. Apparently the dictionary was an obsticle to seeing how obstacle is properly spelt. Old picture, this spelling mistake has since been fixed, but yet keeps getting brought up all the damn time. 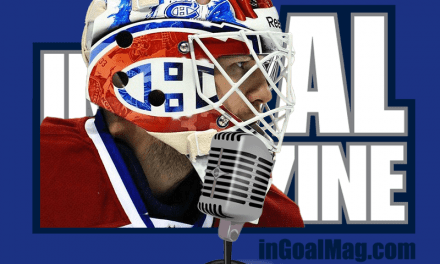 With a feel good story about someone who seems like such a great person, not just a great goalie, I hope the Leafs make the playoffs so we can see more of Remier (that is a lot, coming from a Habs fan). I am glad to see someone not afraid to make a public testimonial about his faith. Maybe Crosby scores, but Jesus saves! 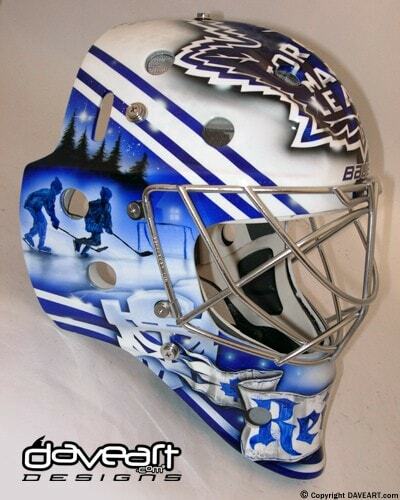 Very cool mask and good to know the details behind this beauty. 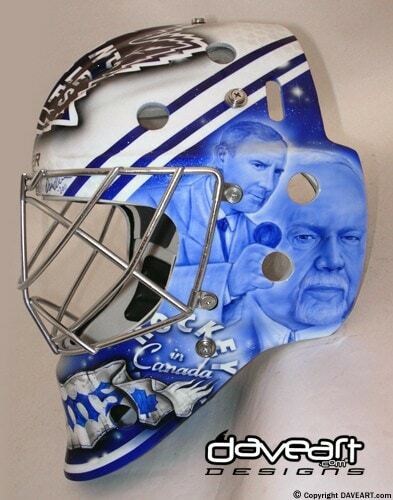 Pretty tacky mask – putting MacLean and Cherry on there is pretty cheesy, that is one step away from putting Steve Simmons and Damien Cox on there. 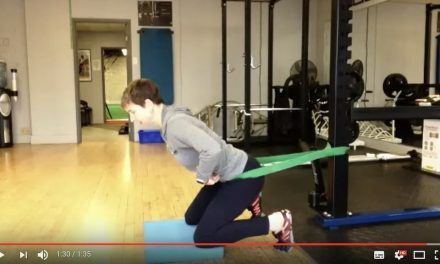 Really comes off as some sucking up. And Jesus and a heart and a saying and everything? Couldn’t they fit the family album in there too? 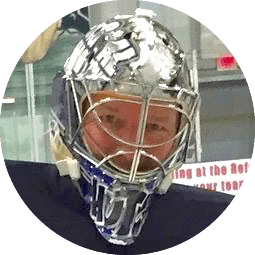 But all of this doesn’t matter – whatever this guy needs to stop more pucks for the Leafs, they can paint his mask pink with green polka dots for all I care. He’s doing a great job, whatever works. It is always a good idea to think of what you are saying before saying it(or writing it). I am sure you would not have been quite so hurtful if you’d just taken a second to consider your words more carefully. Are mocking a mans faith and ridiculing his childhood memories something an adult does? If you have any doubts perhaps you should run it by someone who’s opinions you trust. 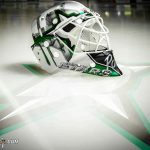 Tim, it’s not sucking up it’s called paying tribute to.. if I was a goalie in the NHL there is no doubt there would be a image of Stewart Copeland on my mask somewhere, it’s not like this is the first time a goalie has had a real life figure of some sort on his mask. 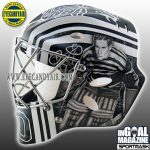 He grew up loving Coach’s Corner (as did I) I see no problem with paying tribute to them, his whole front part of the mask payed tribute to his childhood. Anyways.. it’s great I love it, the more the better! The impression we all get of the Maple Leafs is mostly one of superiority and indifference. Ironic considering they’re always a losing team. 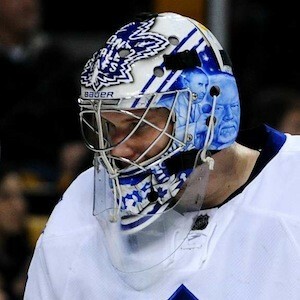 I think the team needs more guys like Reimer who you can actually root for – cuz they’re deep-down decent people. You’re right but Mtl fans are just as ridiculous as Leaf fans. Can’t argue that. In response to what Tim said…as a Christian, I guess this is the time to turn the other cheek. I honestly feel sorry for a guy like you who feels he has to take a cheap shot at a professional athlete who is actually living a life that is worthy of being a role model to our younger and older generations. You point out every little problem you see with his mask that is personal to him…like his saying. The problem is that you think his little saying is just that…a little saying…when really this is the way he lives his life. 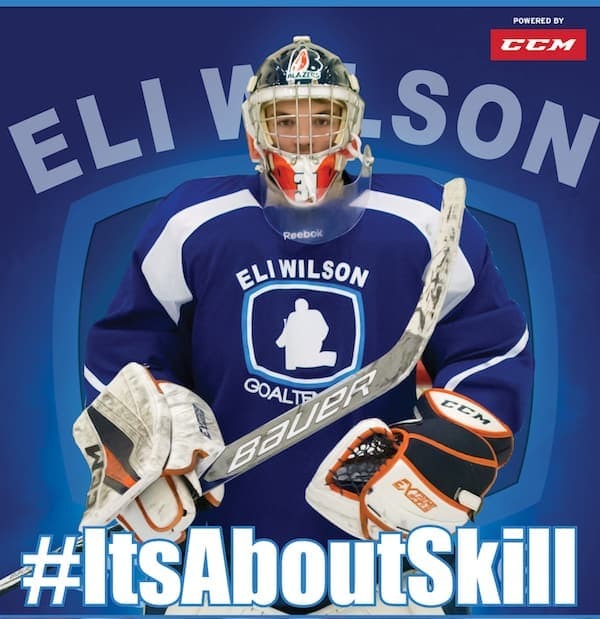 Phillipians 3:14 says “I press on towards the goal to win the prize which God has called me heavenward in Christ Jesus.” We all have obstacles in life…as a goalie…he’s going to have tough games in net, that why he needs to remain focused on Jesus during those times. Jesus is the goal when life presents the obstacles. I completely admire his courage to stand firm in his faith. For 21 years of age…this guy has his head on completely straight and I wish him nothing but the best of success in the NHL with the Leafs. Good for Reimer to not be ashamed of who he is…”If you reject me infront of men, I will reject you infront of my Father…” Jesus said. Tough times will surely come, but if he hangs on to his faith, I suppose we will chill in heaven and chat about the little pond he played on, and the support he had/has from his folks…All in all, good for the kid! 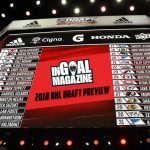 I have been a Leafs fan for the last 27 years. 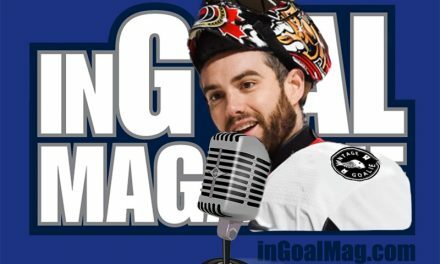 Many of them haven’t been memorable, but since first seeing James play in Feb 2010 in the AHL, followed by being the best goalie in Leafs training camp last Sept, followed by his performance since Jan 1 …I can’t wait for the up coming season. What makes the story better is what a great human being James is. I am 16 years his senior and he is a role model for someone of any age. 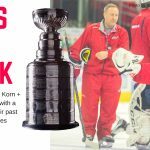 His work ethic, deep faith as a Christian and overall attitude in life especially in the hockey mad environment of T.O is a testiment to him. Best wishes to James and his family, and BTW – awesome mask. Sums up growing up in rural Canada. James, your mask is amazing! I love it and all the thought you put into it. You are making such a strong statement and are a great hero for others to follow! I like it. I reflects his life, his faith and his mantra. It pays tribute to the people and times in his life that are memorable. It also acknowledges his fans. It is a montage of the man inside the mask. the quote is actually from Henry Ford or Vince Lombardi ….depending on who you think said it first. None the less , a very kool quote! Proud of you kid! Win or lose, you and your team are ma homies…God bless! Here is a back view of the helmet as shown on Coach’s Corner a couple of Easters ago.